I have been weaving baskets since 1988 and have made over 1087 baskets as of June 2018. Weaving baskets is my passion. I strive to make each one better than the last. I teach classes a couple times a year, when I have the time, and I hope someday to be known for my high quality of work. My name is Darlene Ryer. I was born in California and now reside in Mountainair, New Mexico. I am a professional artist who is self taught. My traditional baskets are woven out of natural materials, such as red bud, willow, sedge roots, woodwardia ferns, and buck brush, which I gather and prepare myself. I also use basket reed, which is the core of rattan, and raffia, which is a palm leaf, to weave my intricate patterned baskets. 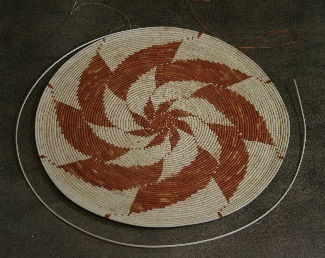 Many of these baskets sometimes take up to a year to complete. Many of my patterns come from nature, and some were given to me from my mother. I have done gallery and fine art shows in California, Oregon, Nevada, Arizona, and New Mexico, and have won several ribbons and awards. My baskets are in many private and corporate collections.